The paraglider consists of a wing, which is connected to the pilot by a harness via lines, risers and carabineers. The wing of the paraglider has close to ellipse shape, when seen from above and has left and right semi wing (the directions are always chosen in relation to the flight direction). The wing consists of cells, divided by walls. The front of the wing is called the leading edge and this is where the cell openings are located. This is where the airflow enters and inflates the wing with air. The back part of the wing is called trailing edge. The outtermost area of each semiwing is called an ear, which ends with a wing tip. The distance between wing tips is called wing span. The inflated wing has an arc shape, when seen from both the front and behind. There is a difference between the projected wing span of an inflated wing and the wing span of a spread on the ground wing. 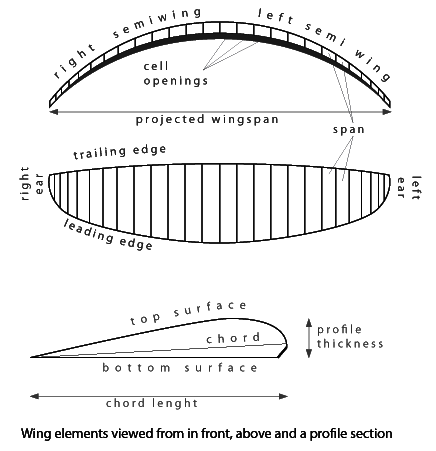 There is also a difference between the projected surface and the surface of a wing. The projected surface area is the one which carries the load, no matter how big the surface of laying on the ground wing. Each semi wing consists of set of profiles, formed by the shape of cell walls. The profile has upper and bottom surface. The distance between the front and back part of each profile is called a chord. The mail characteristics of a profile are chord length, maximal profile thickness and its position. - in flight angle of attack control. The suspension consists of lines, risers and carabineers. The lines are attached to the numerous attachment points at the connection of cell walls with the bottom surface of the wing. As lines make drag, the paraglider constructors strive to reduce their overall length - for example the use of diagonals between cells improves the load distribution and reduces the amount of attachment points. Laternally (if seen from behind), the lines are divided to left and right, according to which semi wing they are connected to. The wing tip is connected to a stabilo line, which has different color and is pulled to clear canopy and lines cravats. Longitudinally (if seen from the side), the lines are in parallel divided to A, B, C and D lines. The A lines are the closest to the leading edge and the D lines are the furthest. The closest to the trailing edge are the brake lines (control lines). The lines that lead directly from the wing surface, are grouped together and united into a thicker line, thus making up the A,B,C,D lines. Finally the lines are connected to the corresponding A, B, C and D risers, through triangular metal elements called maillons. The risers are stitched together in an ear, where the carabineer connects them to the pilot's harness. There is a short riser with a pulley connected to the last riser. The brake line goes through it and connects to the brake handle(control handle). This way, the control remains within the reach of the pilot's arms if he releases it by accident. 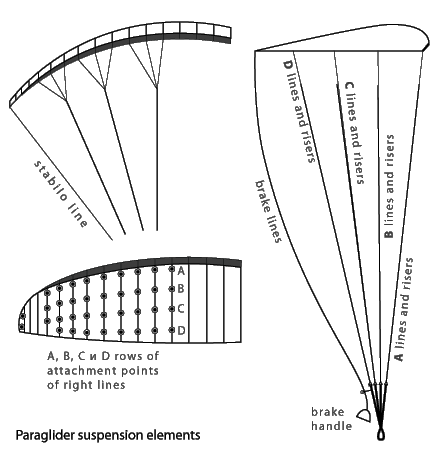 Some modern and sportive paragliders have rigid elements in their construction and may not have C or D lines and risers. The risers are made in such a way, that the pulling of a pulley system on the A riser, pulls consecutively A, B, C and D risers downward and thus reduces the angle of attack. This is called a speed system. Some paragliders have trimmers, which pull or release the last risers and also have an effect of controlling the angle of attack. - allow enough freedom of movement (fast running on take off and landing, easy entering and exiting). Usually, the harness has a rigid seat plate where the pilot sits. Bellow the seat plate the main riser webbing is run. Stitched into this webbing is the loop that holds the carabineers, which attach the pilot to the wing. There are additional loops running from the harness to the carabineers, which give the pilot shoulder and back support. The pilot is secured in the harness by locking a chest belt (strap) between the carabineers and leg belts (straps). The leg strap locking is very important because there are still lethal cases of pilots who slipped down from the harness. Most of modern harnesses have their chest strap attached to the leg strap with an additional strap which prevents the falling of the pilot if he forgets to lock the leg straps. Some producers also use combined chest-leg straps. The beginner's harnesses are sitting type, while the experienced pilots try to reduce their body drag and use laying type of harness with a streamlined bag for their legs. 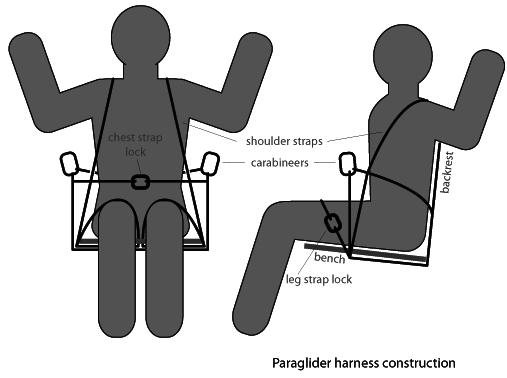 To avoid leg tingleness by the bench edge after hours long flying, some harnesses can be equipped with a stirrup, which carries part of legs' weight. It also allows for better body position control and easy entering and exiting of the harness on take off and landing. Usually a sling connects the stirrup with the speed system, which makes it easy to find and work with pilot's legs. 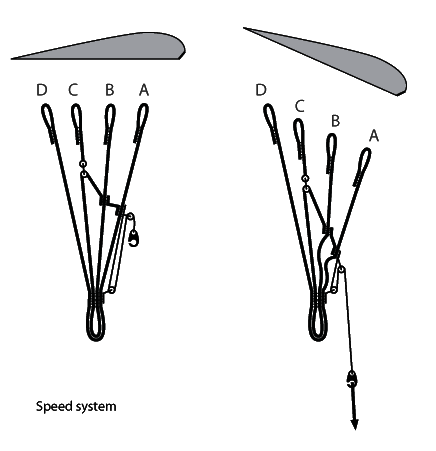 It’s important not to use the speed system as a stirrup. Except some special harnesses (lightweight for hiking, acrobatics and others), the harnesses are equipped with a back protector, which protects the pelvis and the back spine against serious injuries. The back protector consists of a molded piece of plastic foam, which must conform to an industry standard thickness. It is placed in a tight cover within the harness, ensuring it is always in the correct position to protect the pilot. It will absorb and distribute the energy from an impact. The same principle is used for the additional airbag systems. These harnesses allow the bottom portion to be filled with air when in flight, but a one-way valve at their entrance traps the air creating a cushion in the even? of an impact. The paragliding harness producers decide where to place the rescue parachute compartment - under the seat, at the back or in a separate container attached to the chest or side straps (front container, side container). The rescue parachute handle should be at a convenient place, where it's easy to reach, pull and throw the rescue parachute. The rescue parachute compartment and the whole rescue system should not be too tight for difficult pull out or too lose for sporadically dropping and opening. The rescue parachute belt is connected to the harness behind the pilot shoulders via additional risers. Thus, during the parachute descent, the pilot body leans ergonomically slightly forward and ready for better absorbing of the impact. To fight fear, the beginner pilot has to trust the wing that they are strapping themselves to. The paraglider sail is made of synthetic fabric (Skytex, Galvanor) which is reinforced against tearing. The producers choose different fabric thickness (g/m2) and properties for different parts of the wing (upper surface, bottom surface, ribs, leading edge). The fabrics are mechanically woven, colored and impregnated with thorough quality control. The fabric impregnation with special coating protects it against UV rays and reduces its porosity (air tightness). The fabric reduces its quality with time, usage, exposure to sun, mechanical friction (take offs, landings). At the end of a wings lifespan (about 500 hours or flights), most of the fabric porosity is worn out, which causes rapid ageing of fabric threads. The fabric condition is monitored by counting airtime and by porosity and bettsometer checks. Depending on the suspension construction, the producers use lines with different thicknesses. The most common materials are Kevlar, Dyneema, Aramid and Polyester. 0.8 mm thick line holds 80 kg, 2.2 mm - 220 kg. The paraglider lines outlast the fabric lifespan, except if damaged. This is not valid for the unsheathed "competition" lines, which are more exposed to external influences (UV, H2O, etc.) and have to be replaced every 150-200 hours. Throughout normal usage, due to external influences, the lines change their length and have to be checked for deviations periodically. Often the moisture causes 2-5 cm shrinkage of sheathing of lightly loaded C and D lines, which changes the profile curvature and angle of attack. Such deviations are slightly perceivable at beginner's gliders, but can cause dramatic changes in flight modes and behavior of high performance models with thin and sensitive profiles. The lines are connected to the risers via triangular steel mayons. They have thread and screw which allows them to open to replace lines. 3 mm Stainless Oval Maillon holds longitudinally 800 kg and 160 kg laternally. The pilot weight is carried mainly by left and right ? and B risers. It is measured that a 25 m2 wing, loaded with 75 kg pilot, has 16 kg force on each A riser and 10 kg force on each B riser. The paraglider and harness tests require them to stand up to 10 G (10? the pilot weight), without destruction of construction or its elements (tearing of lines, stitches, fabric, risers, breaking of carabineers, etc.). Taking good care of your paraglider prolongs its lifespan and gives you safety and comfort in the air. The main reasons for ageing and weakening of paraglider materials are environmental and mechanical influences. The environmental influences are due to sunlight (UV), atmospheric moisture and temperature changes. - catching and hooking of branches, bushes thorns, roots, stones, rocks and others, which together with stepping on the sail and the lines can cause tears and damage. - do not expose to sunlight unnecessary the wing, lines, risers and harness are all susceptible to UV damage. This is because they are made of petrol based synthetic materials, which quickly age by exposure to UV rays. The thin paragliding fabric is especially vulnerable! - avoid unnecessary friction into the ground or other surfaces. Even the dry grass works like a sandpaper! - check carefully if pulling of the wing for take off won't catch the sail or the lines into stones, roots, bushes, etc, which may tear or damage the wing. If wind moves your wing on the take off, then check again for possible catching. Be ready to stop pulling the paraglider if you feel it’s caught somewhere. The best is to inflate the canopy several times before taking off, in order to sort out the wing and the lines, to check the terrain and the conditions, to smoothen the take off. - paragliding producers recommend periodic checks of condition of the paraglider in specialized test centers(http://test.skynomad.com/bg/). - unpicked or broken stitches. Small rips up to 10 cm can be repaired with a special rip stop adhesive sticker, which usually comes with every new glider. A strip of repair tape slightly bigger than the tear is cut with rounded corners. This helps prevent ungluing by dust and pollution. The area around the tear is cleaned with moist soft cloth and let to dry. The broken parts are matched together and the sticking patch is glued on them. It's good to have a solid base bellow to allow good pressurizing of the sticker to the fabric with a solid object (a finger nail). If the ripped part is 2-10 cm big, then sticking on both sides is recommended. Bigger rips are taped and stitched. Occasionally a tear is so big it requires the replacement of the whole cell, which can be done by the manufacturer or specialized repairmen centers. Tears close to stitching at cell's borders also require specialized repairmen. The most dangerous type of rip is located at the top surface near the leading edge, where most of the aerodynamical force is created and where the highest wing loadings are. The line sheathing rips are not dangerous, unless the line core is damaged too. It is possible to join temporarily the broken sheathing ends by gluing them with a sticker. Still, these lines should be replaced sooner as they're vulnerable to further damage and environmental influences. The damaged line is replaced with an identical supplied by the producer or made by a specialist according to the producer specifications and after a symmetry check with the other semi wing. Tying up a broken line is not allowed because knots can reduce the strength by up to 40% and because the shortening of lines changes the profile and compromises the safety. Partly torn or worn out risers or speed system elements have to be replaced completely. Deformed or non-operational elements like mayons, carabineers or pulleys have to be replaced.